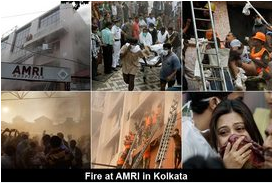 Kolkata fire: Over 90 dead in AMRI fire, owners surrender. Bail not granted. Kolkata: The owners of AMRI Hospital RS Goenka and SK Todi were on their way to surrender before the Kolkata police at Lal Bazar police station on Friday after a major fire at the hspital in South Kolkata left 73 dead. West Bengal Chief Minister Mamata Banerjee claimed that at least 73 people are dead in the major fire that broke out at AMRI Hospital in Dhakuria in south Kolkata on Friday. Out of the 73 dead, 70 were patients and 3 were the hospital staff. Reports said that the hospital authorities fled from the spot. Meanwhile, the registration of the hospital has also been cancelled by Mamata. Out of the 150 people admitted in the hospital, 90 were rescued. As angry relatives gathered at the hospital to look for their loved ones, they vent their ire at the lack of relief and rescue efforts by the hospital authorities by damaging AMRI's properties. AMRI Hospital is jointly promoted by the RS Goenka-led Emami Group and the SK Todi-led Shrachi Group of companies. Emami shares were down by 1.71 per cent when the news last came in on Friday ( Sensex fell by 1.8 per cent). The fire was under control. Nearly 25 fire tenders were working hard to evacuate all patients and staff. Mamata rushed to the spot on Friday morning to take stock of the situation and also ordered an FIR against the hospital authorities. There was still no clarity on what caused the fire. West Bengal Health Minister Sudip Bandhyopadhyay said that the West Bengal Government was shocked to know that the fire safety measures were not in place in the hospital. However, Senior Vice President of the AMRI hospital Dr S Upadhyay claimed all the necessary fire equipment was in place. The angry relatives of the patients who died alleged that the hospital staff abandoned patients and did not help them rush out. They said that this resulted in suffocation, and therefore, deaths of the patients. "Isn't it strange that in such a fire only patients lose their lives and not a single casualty from the hospital. They left the patients to choke to death," said an angry relative of a patient. Upset and angry relatives destroyed hospital property shouting slogans against authorities for not having enough fire safety measures. The fire had also engulfed the ICU and relatives claim that they were the ones who rescued most patients and that help arrived much later. A few of them also heckled officials at the spot. The hospital announced that the family of those who have died will be paid Rs 5 lakh as compensation. Reports said many bodies were moved to SSKM hospital. The identification of bodies was on but sources said some of the bodies may not be identified as they were charred. "The fire engulfed four floors of one of the buildings of the AMRI hospital in Dhakuria," an officer manning the city police control room told IANS over phone. The 161-bed hospital is located in Dhakuria in Kolkata. Firemen using ladders smashed window panes in the facade to rescue patients trapped inside the ICU, ICCU, ITU and Critical Care units. Fire Services Minister Javed Khan said the fire spread because of stocks of highly combustible material. The hospital also did not have proper fire-fighting equipment, he said. Fire brigade sources said that firemen were trying to locate oxygen cylinders stocked on the floors, as the fire could make them explode.